Instead of spending my snow day munching burritos, I am finishing up some projects in desperate need of attention while enjoying the film adaptation–and Martin Scorsese directed (god! I love him! and his glasses! )– of Edith Wharton’s amazing society novel, The Age of Innocence. Who doesn’t need a little Daniel Day Lewis in their life every now and again, I ask? Especially when there aren’t any burritos in sight. 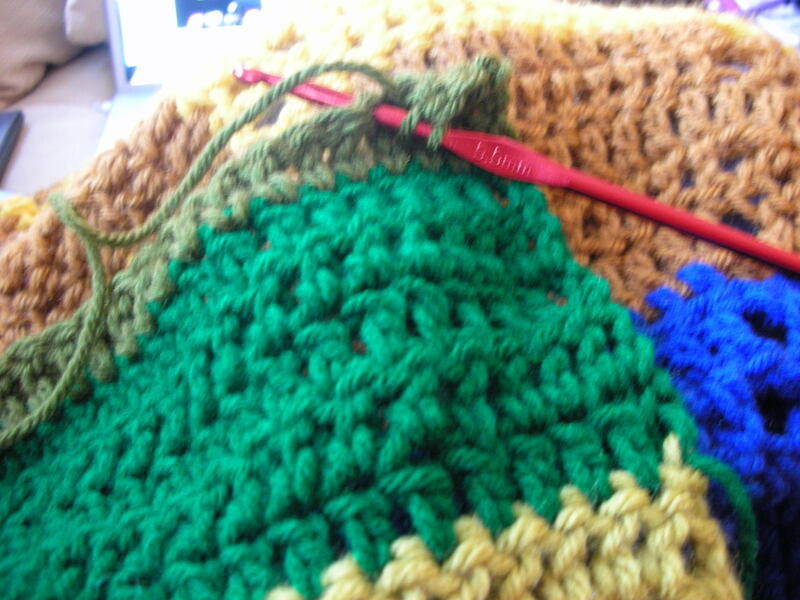 I’ve decided to finish up some crochet projects that I’ve neglected since summer. Yes summer! Last June, I was dead set on making these brilliant chevron crochet afghans and the finished product really should have convinced me to finish up the last one I started. This is the third in the series, but for some reason, I could not bring myself to finish. It’s been sitting in a box since August and I’ve felt so guilty every time I stick my head in the closet and see it. The pattern for the afghan was in the July/August issue of Crochet Today, which you can check out here. Honestly, my excuse would be that it’s unbearable in summer months to have a hot afghan on your lap as you finish–the larger it gets, the harder it is to have a heavy blanket covering your legs when the sun shines dead on you. And so, I finish up old projects. This particular afghan is adapted from the original–the stripes a set of five in one color, rather than two. The previous version were more candy colored goodness–with rainbow tendencies–while this one is more strict, with a gradiation of greens to golds to blues. I’m pretty pleased with it. Here’s to hoping it’s completed today. I’ll post photos of all the afghans when they are complete. Didn’t Dan Rather once declare California the Big Burrito? I would desperately like a delicious burrito right now. But that snowday has turned into a “stay undercover not jump around in snowboots” kind of a day since it is currently spitting slit from the sky, ruining all that pretty white stuff and making me feel very grateful that I actually already got out and cleaned off my entire car before the ice and rains came. 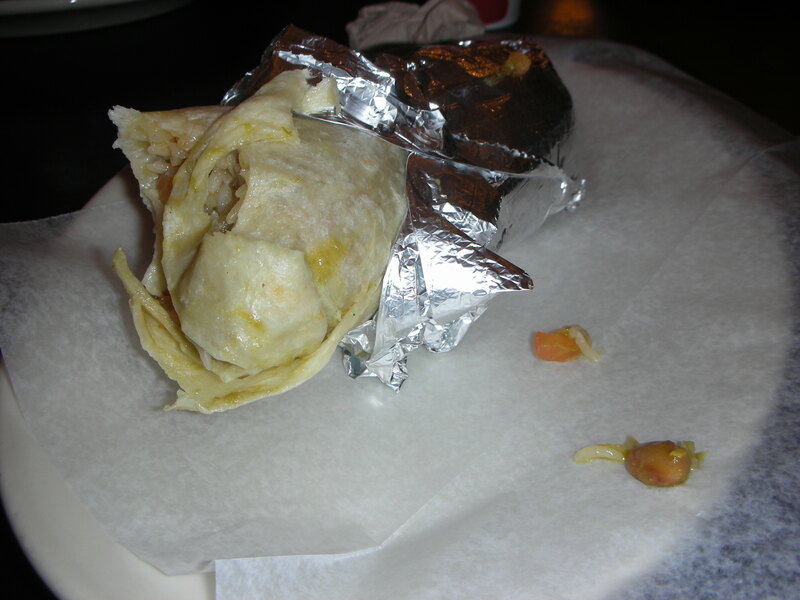 That being said, I have but this photo of a yummy burrito from Anna’s Taqueria just down the road from my house to stare at instead of eat at. File Under: Maybe it isn’t helping that I have so many photos of food on my coputer? Ber-ate me for wearing this or think ber-aayyy I want one of those, too. Either way. 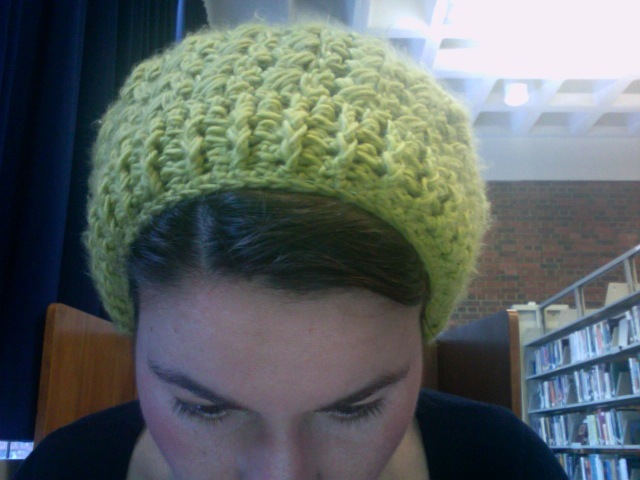 I finally made another beret that I adore, but actually wear this time! Instead of knitting yet another beret I would never wear despite loving, I decided to give a crocheted version a whirl with this beautiful yellow yarn I had laying in my stash–just enough for a small cap, not quite enough for anything else, like mittens or scarves. And I must say, I couldn’t be happier, as evidenced by the photo of me wearing this lovely cap in work. I often don’t have time to leave the house in the morning with dry hair and this hat was a perfect life-saver, keeping the hair tucked in so as not to freeze as soon as I hit the arctic mass, and not giving me the slightest bit of odd hat hair. 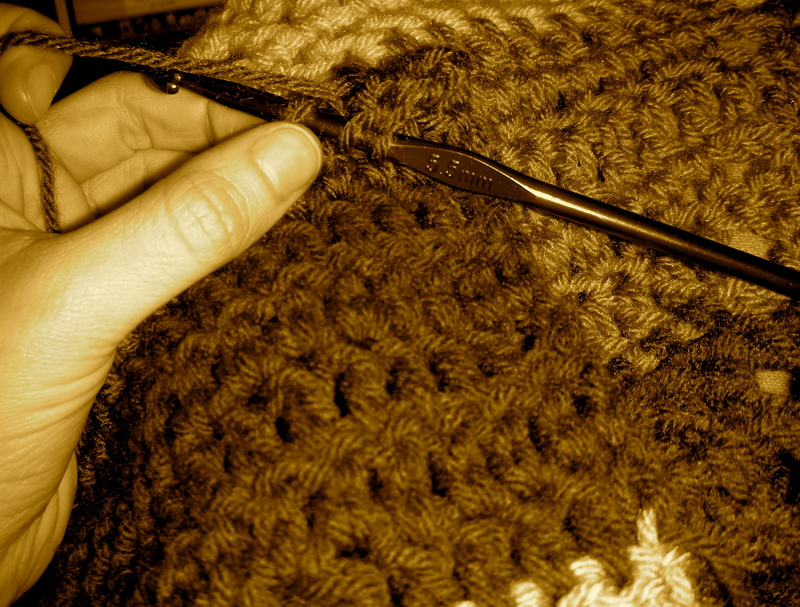 The crochet pattern was basically conceived as I went along and after it was complete I worked in some skinny elastic along the chained edge so the beret would actually stay in place–the key to a successful beret-style hat. My only disappointment is this yarn can be a bit fuzzy, thus the balls of fiber accumulating at the top and turning bits of it a tad furry. I hate that. Besides that I hope to have time to write up a pattern soon and maybe consider making it again with a less fuzz-inducing fiber, but until then…swoon? Knitting in twilight? Yes, sir. That’s me, working on yet another one of those Twilight-inspired Bella Swan mittens, which are just the most scrumptous design ever it should be a travesty they landed in that pathetic excuse for a movie. I honestly can’t decide whether to actually keep this pair for myself or gift them out. I think I might gift them out–for some reason, I have a hankering for mine in a gray colorway or some sort of dark tweed. What do you think? Save? Gift out? I wish I had remained in the Twilight regarding this film…except for the mittens, of course. 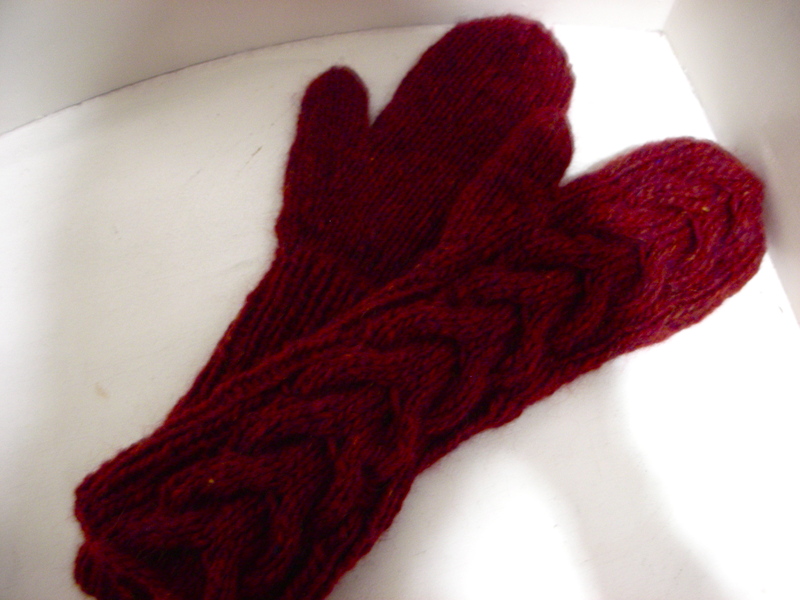 I’m finally getting around to posting those Bella Swan inspired mittens I made as a birthday gift for a friend. I think they came out beyond splendid (as I’ve already started making another pair and have one mitten done and a second cast on in this amazing bluish gray yarn) and I’m pretty sure they were a well-liked gift. I’m hoping to make a pair for myself and some others, but I’ll have to be patient as I don’t think many of the yarns in my stash will be the perfect match for these amazing cabled mitts. It’s all in the yarn kittens, all in the yarn. I’m quite pleased with how well the yarn took the horseshoe like cable since it was a tweed yarn, but it’s not distracting at all. 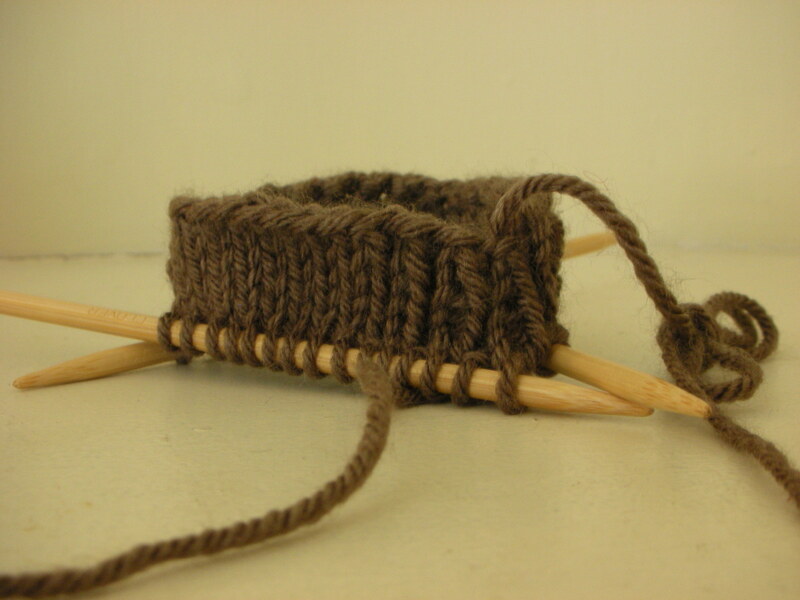 What’s more, the ribbing at the top gives them this really cool stretch. 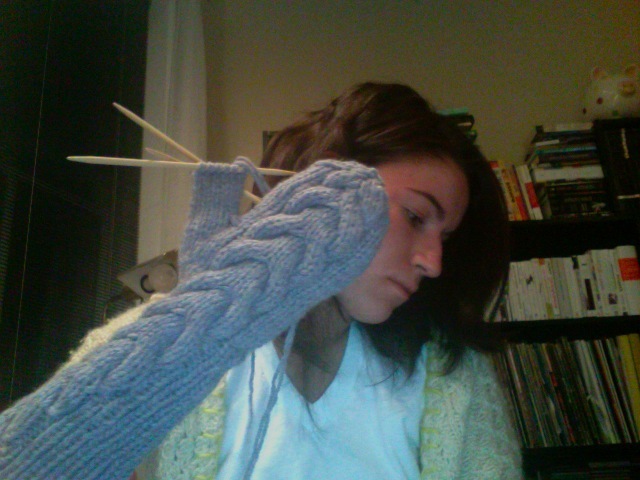 Golf freaking claps to the designer, Subliminal Rabbit, for creating the pattern for these glorious mitts. Golf freaking claps. Naturally, I had to be all goofy and try them on all different ways and no hows and go nuts. Because, welp, who wouldn’t want to, really? Inspiration from the most unlikely of places? Nevah. The inspiration for my latest small project, which must remain a secret….for now. 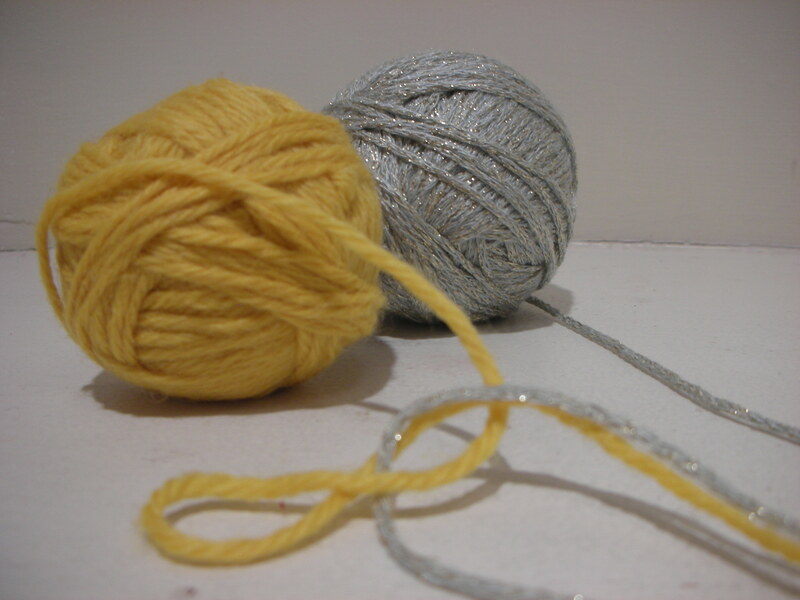 I feel as though the bright yellow worsted weight wool, paired with the silky, shiny, blue yarn with flecks of gold will complement each other beautifully for the intended project. Keeping my fingers crossed it will work out as I envision it. File Under: Tomorrow night after work, I plan to squarly plant on the couch straight knitting and reading in anticipation of the weekend. Weeeee. Sock one to my heart…. This is the taste of sweet….defeat? After casting on a new pair of yummy socks for myself (hey, I only have one pair, the rest I’ve made gifted out) this weekend while I was at a hockey game, I was swiftly moving along, finishing the cuff and getting at least two inches of the leg complete before realizing there was no way this sock was going to fit my calf. 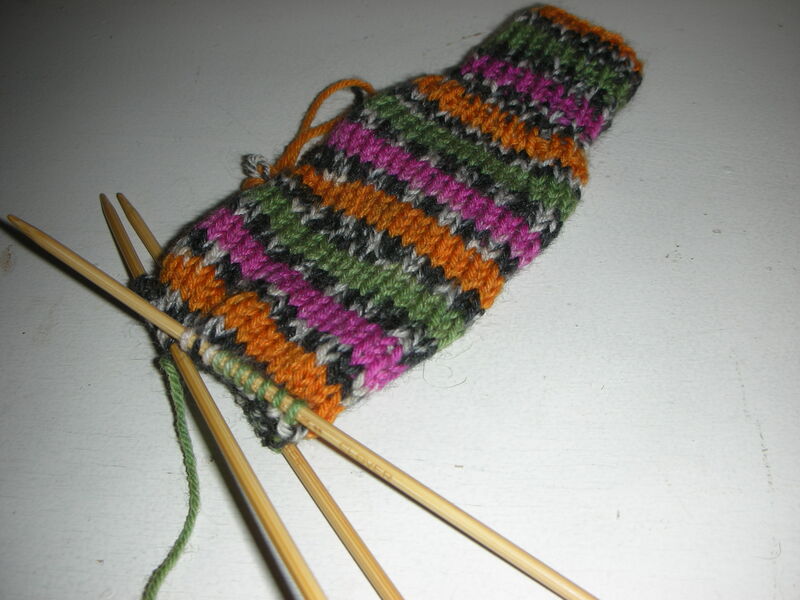 Apparently I cast on too few stitches because I used size 3 needles (I usually always use size 2 and 1 dpns when I make socks but had to improvise when one of my size 2 bamboos went missing last week) and thought the gauge would make them a lot bigger then in fact they did. I have yet to yank the entire thing out, but its inevitable really. There’s nothing more frustrating than a miscalculation and the realization that this project is never going to work and must be yanked back. It happens more than not in knitting but never gets easier to stomach. Pfff on those scholars who attribute the blues strictly to tragedy…there are no blues to be had reading these books. I have had my head in pleasure reading books for the last couple of weeks, especially since classes in my last semester of library school (!) have yet to begin so all it is now is working and reading and crafting. 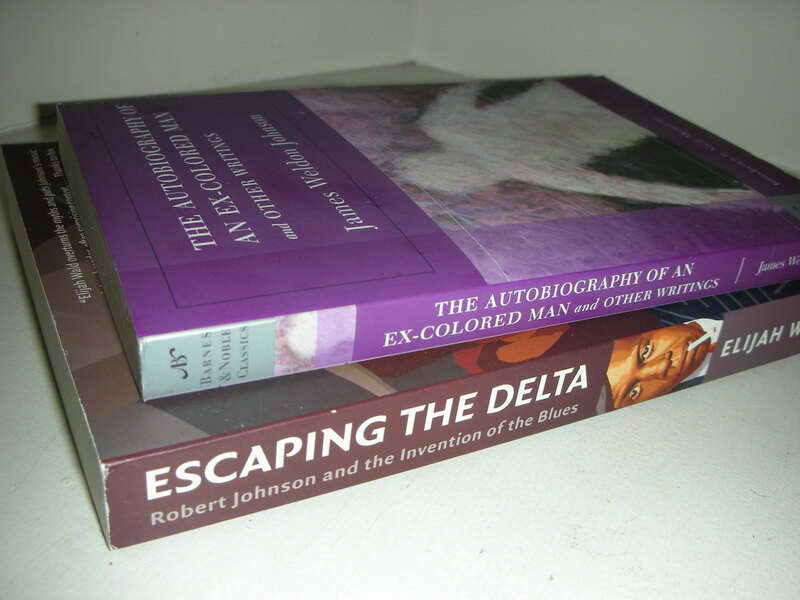 The other day I picked up two reads I’ve been dying to check out for quite some time–James Weldon Johnson’s classic novel, “The Autobiography of an Ex-Colored Man”, which was one of the first novels to feature an African-American main character. Johnson published the novel anonymously in 1912, but it failed to gain recognition until its re-release in 1927 at the height of the Harlem Renaissance when many were exploring racial ambiguity and the like. Johnson’s book is filled with ragtime music, cigar factories, gambling elites in New York, and the constant weaving of life in white society and black society by the book’s lead character, whose skin is “light enough” to pass in both sectors. Now considered one of the great classics alongside the works of Langston Hughes and Richard Wright, Weldon Johnson wasn’t just a novelist–he was a poet, composer, journalist, educator, and even diplomat. Similarly, as any of you know who read my music blog, I am an obsessive devotee of all things American blues music, and so it seemed necessary, since I’ve read many another book on this genre already, to finally pick up a biography of Robert Johnson, the ultimate pioneer of blues music who was left unrecognized by most of his black peers during his heyday. “Escaping the Delta: Robert Johnson and the Invention of the Blues” by Elijah Wald, examines the music, the newspapers, other archival material, and even interviews a whole slew of musicians to discover why Johnson was largely ignored by core black audiences in the 1930s only to eventually be considered the most formidable blues man…ever. It’s a generous read, separating all the junk from the worth, without feeling excessively heady or filled with notes, and something I highly recommend if you enjoy music or American history. File Under: What are you reading? I finally finished both of the Iceland tweed lopi Twilight inspired cabled mittens I mentioned earlier in the week and I haven’t been this pleased with the outcome for a project in quite some time. I would post a finished product photo (of which I’ve taken plenty) but I have to wait a week as I’ve decided they are so scrumptious they must be that birthday gift I mentioned I needed to have in line for next week. What’s more, I am so pleased with them, I immediately cast-on another pair using a gray-ish blue yarn that’s slightly less bulky than the lopi yarn as a sort of experiment. I used the exact yarn specifications and had the exact same gauge as requested for the mittens, but somehow I found myself adapting it toward the end and shortening the finger area because the mittens were looking way too long for a normal hand. Did anyone make these and find themselves using similar modifications? I can’t figure out why this is so, but they look splendid with one less cable repeat on the hand, so I couldn’t be more pleased that my gambles in mods worked out perfectly. 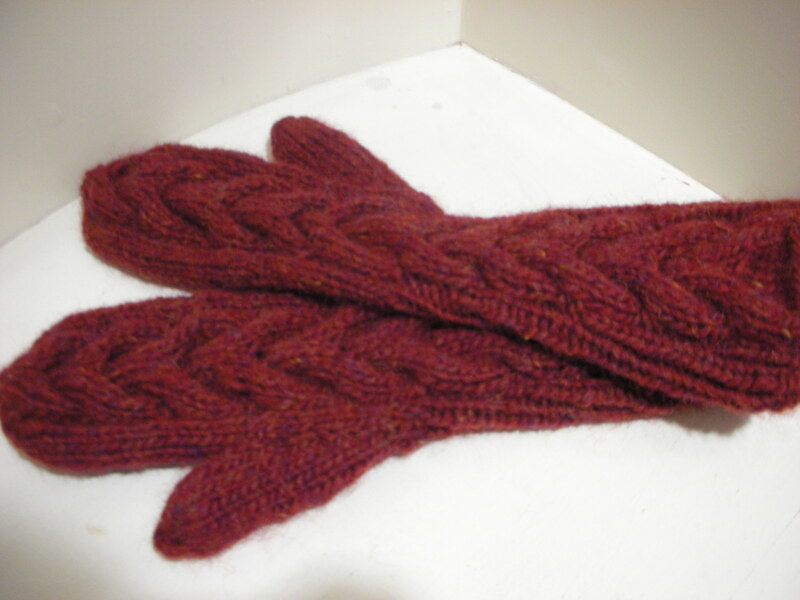 I’m so in love with these mittens despite my lack of knowledge of all things Twilight, but a lady in my work whose daughter is obsessed with Bella Swan said she’d love a pair for her daughter so perhaps put that on the list, too. You can check out frames from the film if you want a better idea. 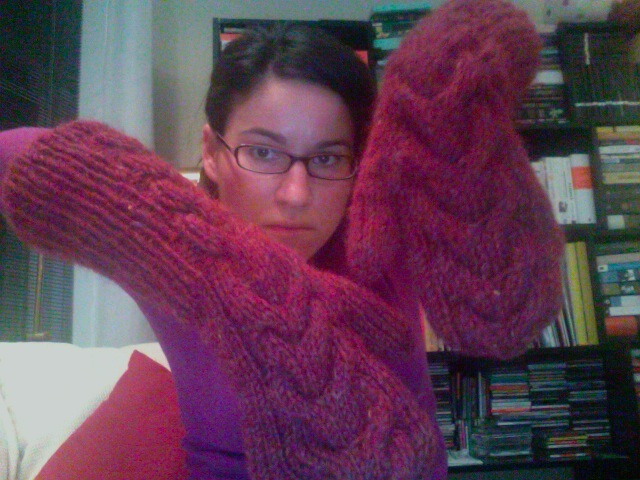 Promises to post photos of these immense mittens post birthday party this coming weekend. Get in line for a pair! Sal(i)v(ating) for some face salve? I am addicted to Smith’s Salves and Balms. 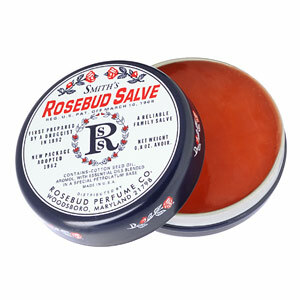 I have the original Rosebud Salve for all things chapped, as well as the delicious Brambleberry Rose. These are the most perfect products for those chapped lips and chins and elbows here in Boston’s bitter blast, but I’m desperately in search of a good, all natural menthol-based facewash that tingles like a good Smith’s Lip Salve. Tingly mentholy bath products are kind of an addiction of mine. I’m not too much into smelly girly product, but I wash my hair exclusively with a tingling clarify-er which is basically tea tree oil which makes your scalp feel all cool and your hair smell like minty deliciousness and scrub my body with ginger and citrus and dab my lips with Rosebud Salve and there’s my beauty regiment. But what’s been sorely lacking is a similar experience for my face a couple times a week to reinvigorate it. Anyone have any suggestions of what they use? I want something light but tingly and nothing acne-fighting or somesuch random nonsense I’ve browsed the drugstore aisles and seen before. Unfortunately, all the natural menthol or tea tree based face products I’ve found thusly are for men. Would this work on a woman’s face? Quality and Quantity Abound: New Cheap Yarns. Lion Brand, one of the giant manufacturers of commercial yarns, has recently announced a new “Luxery Collection” of yarns, which feature organic wool, organic cotton-bamboo, a delicious super-wash merino wool, an incredible wool stainless steel, and even cashmere. This makes me gush because while they are as pricey as many of the other fine yarns, it is along the lines of KnitPicks–affordable, but genuine. The organic wool, at $10 a skein, is absolutely drool worthy, particularly in the toffee, avocado, and redwood colors, and I must must must pick some of these up (once I save some coin). The yarns are only available at the LB Studio in NY or online, so you can order up or take a gander at their collection here. The prices range from $5 a skein to $15, depending on the luxery type and weight. I can already envision the projects I want to make with these yummy new additions. What do you think? LB Luxery good or gimmicky? Methinks its a nice alternative to Knitpicks, no? Especially when you own everything KP already has to offer and you’re a broke library student and parttime writer. But, while we’re mentioning geniune but cheap yarns, KnitPicks has just changed their set of self-striping sock yarns again. Start saving those pennies my sock yarn sluts. Wantsies, wantsies, wantsies. Be mindful, kittens. Some of the old stripes are now on clearance. Calling an order needed for the “Gelato”. There was not a single thing “Grim” about a place of Providence? This Sunday I went to visit a quite good friend in the place of my birth, fittingly named Providence because any place I entered the world would be just such. Er, strike that, reverse? Anyways, I went to visit my good mate MacKenzie and while we gorged on brunch at a little nook, never ending mugs of coffee, and of course braced snowy conditions (our tradition, apparently? ), we also got a chance to nod into the famed Brown University Graduate School Pub, where her boyfriend (currently getting his phd in cog science) hangs his hat many a day. The place was dark and quiet (save for some excellent tunes on the juke and of course a brilliantly dreaded up kid at the bar clearly on items besides the pints in front of him) and the beer selections just excellent, which is where MacKenzie’s lovely Jon introduced me to Grimbergen, a malty, adventure in your mouth bitter which I’d never tried before and quickly scribbled on the beer list always housed in my wallet. And for some reason, this blurred photo of my stately glass of Grimbergen does the entire day beauty and justice, methinks. 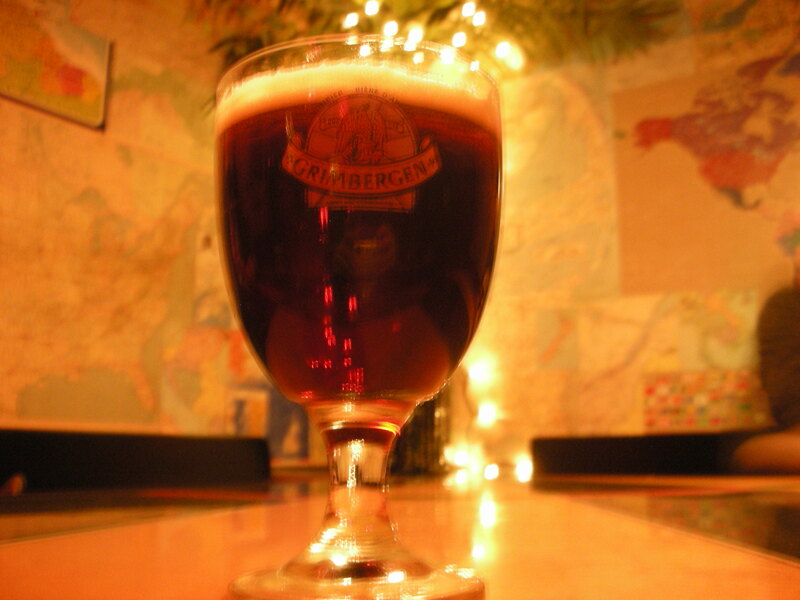 If you ever get down to Providence and you have a friend who attends graduate school at Brown, might I suggest a Grimbergen? I’ll be sure to be back. I can envision it being a perfect place to rest my own hat, grab a pint, and pick up my knitting needles. File Under: Next time, Ms. Dunn?